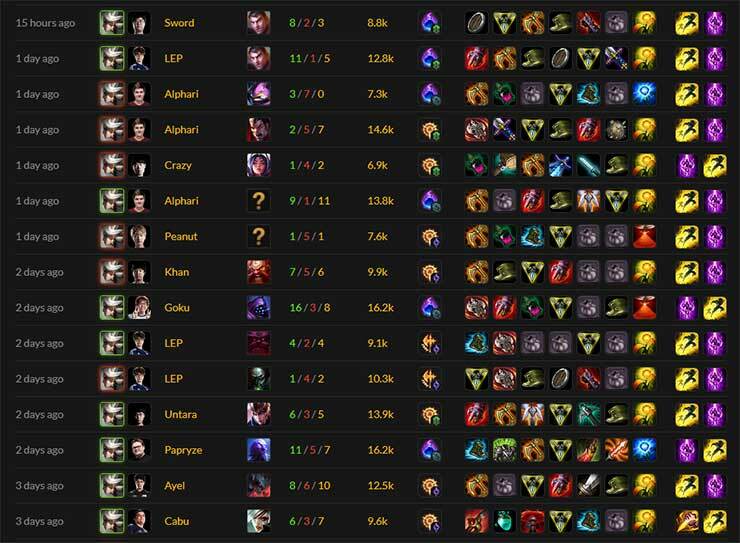 In League of Legends, there are good matchups, even matchups, and matchups that make you question why you continue playing the game. The Top lane is one of the most viable lanes for climbing solo queue in the game with a range of different champions that can be played there. From tanks to fighters, mages to marksman – the Top lane can be one of the most fiesta and one-sided lanes in the game. In this guide by PicklePants, we will discuss what you can do when you are playing as a fighting or dueling champion against a tank. Before we begin, I would like to state that everything in this guide is situational. Depending on the matchup you are in and the champion you are playing, some of the information may not be viable for every situation. When this is the case, you will need to adapt and change your play style and play accordingly. When you play a fighter champion, you may think about taking Doran’s Blade as your main starting item. Doran’s Blade allows you to deal extra damage in the laning phase, while also getting the opportunity to kill the enemy. It is a great start for many fighting and dueling champions as they benefit greatly from the extra damage, health, and life steal that Doran’s Blade provides. 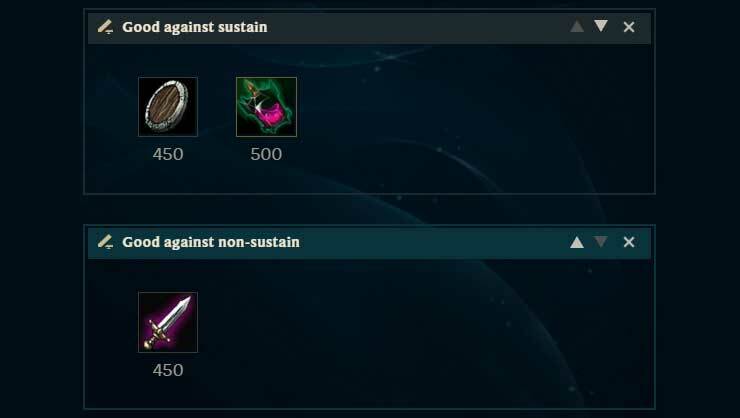 However, if you are in a matchup where the enemy has lots of sustain (like many tanks do,) you may be unable to benefit from taking Doran’s Blade as you’re starting item. This is because they will out sustain you in the lane and they will neglect some of the damage that you do to them. One example would be Maokai who’s passive grants him healing throughout the game. Furthermore, some tank champions choose to opt for early sustain as they know they will be unable to kill the enemy. If you were to trade with an enemy who has lots of sustain, they would be able to regenerate or get the health back while you would be unable to. This may also leave you in hot water as the enemy Jungler may be able to gank you, or you would need to play passive and not fight the enemy as you may be low from a previous trade. If you are against a sustain champion, you may want to match their sustain by taking Corrupting Potion. If you are against a tank that deals lots of damage, you may also want to take Corrupting Potion. If you are a champion who is not necessarily good in the laning phase, you may want to take Doran’s Shield, Doran’s Blade or Corrupting Potion. A good example would be Camille. She is one of the better dueling champions in the current meta, but her early levels are incredibly weak compared to many others. In most situations, she would want to take Corrupting Potion to protect her from falling behind. Once Camille is behind, it can be quite difficult for her to get back into the game. Many people may think that taking Doran’s Blade is good on her because she is a fighter: while it can be beneficial, in most cases, you do not want to take it because you may get put behind. Furthermore, it will give you little to no sustain after each trade. Camille benefits heavily from going for small trades with the enemy and it’s rare for her to 0-100 somebody in the laning phase. It is better for the Camille to chip away at the enemy through short sharp trades. Wave management is a complex subject that has a lot of different factors and variables to the location of where you should keep the minion wave. Wave management in a matchup against a tank is incredibly important in winning the lane. When you are in one of these matchups, you should keep the wave either even in the lane, or near your tower (but outside of the towers range.) I would recommend keeping the wave here so it doesn’t push in either direction. Many tank champions lack any form of escape which means that when they are overextended, they are prone to being ganked or getting killed. Keeping the wave in this area allows you to go in for trades with the enemy. If you push them under tower, you would be unable to fight them or apply pressure to them. This is because the tower will be protecting them. It will prevent you from getting camped and dying frequently. In some cases, tank champions deal more damage compared to fighting champions. Once a tank has some defensive capability, they will start dealing damage to you. Also, many tanks have crowd control which can be used to set up ganks for their Jungler. Keeping the wave here will prevent you from being frequently ganked as you will not be overextended in the lane. It will allow you to zone and deny the enemy. Not every tank is naturally tanky and instead, they need items to become a tank. As you will be able to trade with them, you could go for a trade, burst them down and then proceed to zone them from the minion wave. This will prevent them from getting gold and allow you to safely farm. If they overextend for farm, you will then be able to trade with them and punish them for playing recklessly. We’ve already made an in-depth wave management guide and I would highly recommend that you read that if you want to know more information about specific matchup advice. We spent a lot of time on that guide, and it is one of the best wave management guides out there. If you want a short version of wave management, you need to make sure that the number of minions is even on both sides if you want it to stay in the middle of the lane. The closer to tower you want the wave, the more enemy minions there needs to be alive. In some cases, the differential can be one minion but the closer you get to your tower, you may need two or three additional enemy minions. It really depends on where you want the wave. Here is an image taken from that guide that shows you amount of minions the enemy wave needs in order for it to freeze in a certain position. 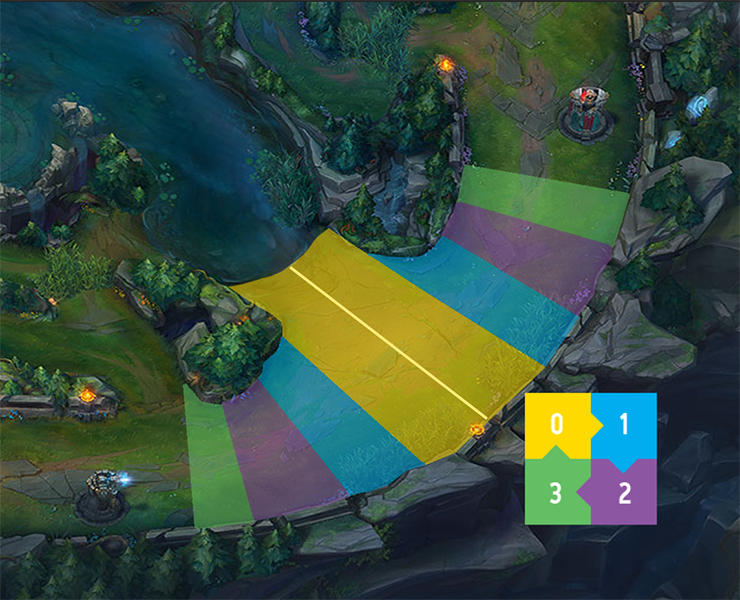 Note that while the image is for the Bot Lane, it works exactly the same for the Top Lane as both lanes are identical. When you’re playing as a fighting champion and you find you are against a tank, you may have mixed emotions. Players may think that they have the upper hand in lane because they are able to duel with the enemy or think that they should beat their enemy in lane. While some dueling champions counter tanks in the early game, but this is not always the case. When you think of a tank in League of Legends, do you usually think of somebody who is pretty weak, immobile and generally easy to abuse? This may be the case for some matchups, but it isn’t always the norm. You would be surprised on how much damage a tank can deal when they have an item behind them. If the player you are against is smart, they will start building items that directly counter your damage. This will mean that you will deal even less damage which can make it hard to abuse them. One issue I see with lower ELO players is that they always want to fight the enemy no matter what. When you are playing as a champion who benefits from short trades, you should trade with the enemy when it benefits you. There is no point going for a trade if the enemy will out damage you or you will come worse off from it. Many players think that to win the lane, you have to get kills. While kills are nice, they are not always needed. I wanted to include this section to the guide because I feel a lot of people do not play adaptive and instead, follow rules or suggestions too closely. Just because somebody says that you should win a certain matchup, it doesn’t mean that you will always be able to. We’ve just told you that you need to respect the enemy and their damage. However, you do not want to give them a free lane by playing too passive or too safe. If you are not a threat to the enemy, then you will not be able to abuse them in lane nor will you be able to win the lane. As you are good at dueling with the enemy, you want to trade when it is in your favor. There are a few different scenarios where you would want to trade with the enemy, and each has its benefits and drawbacks. The main thing to remember is, you need to play to your strengths and abuse the enemies weakness. A good time to trade with the enemy is when they have no form of escaping. For example, if a Maokai uses his W, he will be unable to escape an engage or trade as he will not be able to use his W on any minions to get away. Not every champion has an escape ability, but you should try to abuse the ones that do. Another example would be when the enemy has used one of their core abilities. If the enemy uses an ability to poke with or just to farm, you could go to trade with them as they will be unable to trade effectively back with you. This is because they’ll have fewer abilities to do so with. One of the best times to trade with the enemy is when they’re farming. Many tanks are melee and require them to be in close range to finish off a minion. You can abuse this by trying to fight them when they are in auto-attack- animation-lock. This is a good time to trade as they will be unable to trade back with you as they would have already auto attacked a minion and would not be able to attack you. When the enemy has overextended. We’ve already talked about wave management and where you would want to keep the wave. Keeping the wave in this position will allow you to trade with the enemy and chase them down if they overextend for farm. If you play a lot of Top Lane, you would know how annoying it can be to play against different tanks. Some tanks deal insane amounts of damage and it may feel like you are unable to do anything to them. Dueling champions are not always strong in the early game and they require some time and patience to get going. They cannot always straight up fight the enemy, and instead, they have to chip away at them over time in order to get the kill. Thanks for reading! Next time you play a fighter into a tank, let us know how you do in the comments below. As always, you can find Picklepants in our Discord if you have any questions.